Professor Susan Rodger (Duke University), my daughter Jessica Dickinson Goodman, and I are almost done with our Grace Hopper Celebration of Women and Computing (aka GHC14) project “Notable Women in Computing and Wikipedia”. 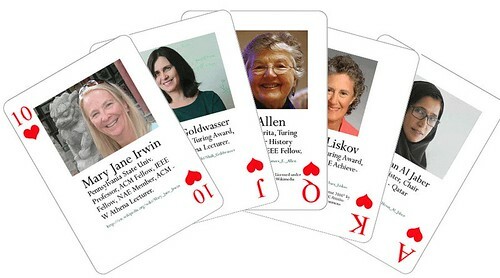 We are collaborating on both a formal GHC14 conference poster plus playing cards featuring 54 notable technical women. This has taken a long time to prepare but they are looking good. The honorees we have worked with have been entirely supportive and excited about this project. This work is associated with the “CRA-W and Anita Borg Institute Wikipedia Project – Writing Wikipedia Pages for Notable Women in Computing” project that Susan and I have worked on for years. Jessica has been our creative designer, production staff, and GHC14 project manager. Duke University and Everwise are project sponsors. Information is not complete on all of the honorees (so there will be some cards featuring just a silhouette) but dozens of the featured women have sent us photos or given us permission to use photos from their professional pages. Ace – Hessa Sultan Al Jaber – Qatar ICT Minister, Chair CS Department – Qatar Univ. Because I am mentoring a TechWomen Emerging Leader from Jordan who is arriving just as GHC14 starts, for the first time in ten years I cannot attend the Hopper Conference myself, but Dr. Susan Rodger will present our poster and she will be distributing the decks of cards from the Duke University table. The cards will be marked Creative Commons * and we will provide instructions if folks want to create another deck with different people honored. We expect that this deck will be a First Edition and that there will be corrections and updates as a result of GHC14 discussions, resulting in a Second Edition. * The Notable Women in Computer Science project is a labor of love for the women behind it, which is why we are licensing the card deck under Creative Commons Attribution-NonCommercial-ShareAlike 3.0 U.S. License. We have done a number of things to ensure this deck only helps, and does not hurt, women in computing. Our efforts included: using public domain images, seeking individual permission for images, seeking to represent the reality of diversity of women in computing, and seeking input on the project from women leaders in technology. If you have a concern (don’t like the public domain photo we found of you, don’t think the photo you took can be licensed in the way we did, decided you did not want to be included) we want to know and we will do our best to help you. Please contact Katy Dickinson (katy dot dickinson at gmail dot com) with questions. How do we get a deck if we are not going to be at GHC14?